Christiane Maute indicates in her book Homeopathy for Plants that wasps, bees, and hornets are the natural enemies of the caterpillars of the cabbage white butterfly. Therefore, treatment of brassicas with these remedies in homeopathic form could possibly minimise the eggs of this butterfly. Here is a report suggesting that this idea is correct, although it is not definitive proof for a homeopathic effect. "I'm very pleased with all the remedies but you need to give it some time to see the results. I treated my curly kale and pumpkin with Apis mellifica 30 C. The large and small cabbage white butterfly avoided the sprayed areas; no infestation with caterpillars, just the occasional leaf was affected. In previous years there was regularly a severe infestation, with around 70% of the plants affected by caterpillars since the garden is sheltered and the cabbage whites can easily fly onto the plants. So the harvest used to turn into a caterpillar hunt. One year it was so bad that we had to throw everything onto the compost. You lose your appetite when you see so many bugs. After I sprayed the plants with Apis mellifica from above and below, the cabbage whites avoided the plants – they turned away when flying towards them. But you need to respray immediately after it rains. Three out of 45 plants had slight problems, with eggs. In total we had about 10 caterpillars after washing the leaves. This meant I could harvest the cabbage twice this year. We picked only 2/3 of the cabbage from the bottom to the top, and sprayed the plants afterwards. The cabbages have now recovered to the point that we can harvest them again." Small green grubs had evidently been feeding on the rosebuds. The roses were sprayed several times with Bombyx. There was no more damage seen and the grubs stayed away. The caterpillar of the Oak Processionary Moth, which are often found in large numbers on oak trees, develop long poisonous hairs with bristles containing nettle toxin. These hairs easily break and can often be carried far on the wind. On contact with the skin, they cause inflammation and reactions similar to an insect bite. Ms Giselle S. sent us the following report on her experience with the homeopathic preparation Bombyx proc.6X, made from the caterpillar of the oak processionary moth. About 3 weeks ago (early June) I bought the remedy Bombyx proc. 6 X from you. Following the description, I treated 10 trees with it – 10 ml in 10 litres of water, 2 watering cans per tree in the root area. It's only a drop in the ocean since there are approximately 100 trees on the piece of land, but I wanted to first see the effect for myself. After about a week, the caterpillars began to avoid the treated trees, no longer climbing onto them. Two weeks after the first application, this behaviour became more obvious: caterpillars that were thrown off by the wind and weather no longer climbed back onto the trees, and other groups marched back down off the tree they were on. They just no longer seemed to like the taste of the leaves. In the meantime I watered the trees again with the remedy. The caterpillars do not seem to be harmed by the treatment but they simply go elsewhere to find other host plants, such as a nearby birch. Like the German saying that old things are no longer tasty but we will not starve for that reason. So do we have to water all the plants and trees in this area in order to starve them?! I did not see this migration with trees that were not treated. 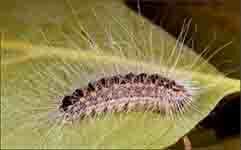 We have had several similar comments about successful treatment of the box tree moth. However, we have also had some reports in which there was either no effect or an insufficient effect. The box trees of family B. from Bürgstadt in Germany were severely infested with box tree moths. First a chemical pesticide was used but without any apparent success. Two weeks later the family sprayed their bushes with Box Tree Moth Extra. After a single application there was a noticeable effect. The next day the caterpillars became lethargic and fell off. The box trees were also sprayed with Arnica 200 C, which strengthened the plants, and they then put out new green shoots from below. Ms B. has a number of attractive boxwoods in her garden. In the middle of May she discovered the first cocoons and signs of damage caused by the box tree moth. The infestation increased very rapidly. 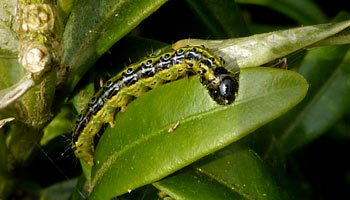 She then thoroughly sprayed the bushes with box tree moth extra , repeating the treatment at weekly intervals. The first treatment put a stop to further damage. A caterpillar was seen moving away from one of the bushes. A week later she could not find any more caterpillars in the bushes. To help the wounds heal and encourage fresh growth, Ms B. then administered Arnica 200 C.
The bushes have now completely recovered. Thuja 6D: Lyonetiidae moths: These little animals had always left marks on the leaves of my Iberis. The leaves looked like parchment paper and, if badly infested, the plants died. The first time I saw them this year, I watered the plants with Thuja 6D (5 ml /10 liters water) and the spell was broken.